How can you make a movie about a comedian coming out of retirement for one last tour with OUT having any jokes? I don’t understand. I’ve always been a fan of Chevy Chase. Sure I heard rumors of him being a difficult person to work with but not knowing if they’re true makes me not care as I like him in what I have seen…except for this one. 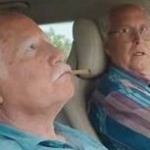 It’s called, “The Last Laugh” starring Chevy Chase and Richard Dreyfuss. Chevy’s character convinces Richard Dreyfuss’ character to come out of retirement for one last tour (he was a former comedian). While I don’t usually review movies, I must say it was a terrible oversight to have this movie be so incredibly unfunny. There are no jokes! Even while Richard’s character is shown performing on stage to an adoring audience, his jokes can’t be heard as it is shown in montage format. Seriously? To watch a movie with Chevy Chase about a comedian going for one last laugh and NOT having one single laugh is a shame…and a waste of time. You can skip this one and re-watch Caddyshack.